The next step that a lot of the major trolling motor manufacturers are taking regarding design is the wireless trolling motor. The vast majority of us have grown up using trolling motors with visible cables running between the foot pedal and control head. Looking from that perspective, a wireless motor is going to give a lot of us hesitation in just how well these newcomers can perform. In our experience, there is a learning curve, but this style of trolling motor is here to stay and does bring some advantages out on the water. In this article, we will take an in-depth look at the Xi5 wireless bow mount trolling motor from MotorGuide. We will break down the model options, features, and even take a look at some other trolling motor options with similar performance specs as the Xi5. In this section, we are going to take a look at all of the features built into the MotorGuide Xi5 trolling motor. In our in-depth review, we will then discuss how these features translate to performance while on the water. Located on the base of the trolling motor mount, the LED dashboard allows you to monitor the status for several trolling motor functions including power on/system ready, propeller on, Pinpoint GPS on, and battery life. The Xi5 comes with a wireless foot pedal which allows you excellent control over the motor from anywhere on the boat. The foot pedal allows control over most functions of the trolling motor and is made from a high impact resistant composite material. The Xi5 uses a variable speed system that allows you full control over the entirety of the motors speed range. This allows you much finer control over the motor and also aids in conserving battery power. One of the main selling points for the MotorGuide Xi5 is the amount of research and development that has gone into maximizing the efficiency of the motor’s digital systems. By cutting down on wasted energy that is lost as heat, the Xi5’s digital systems, which is a huge part of the trolling motor, is more efficient than trolling motors have ever been. Larger motors have always come with the downside of being bulky and taking up a lot of space on the boat. The low profile mount of the Xi5 reduces this bulkiness without sacrificing the stability of the motor when stowed and deployed. 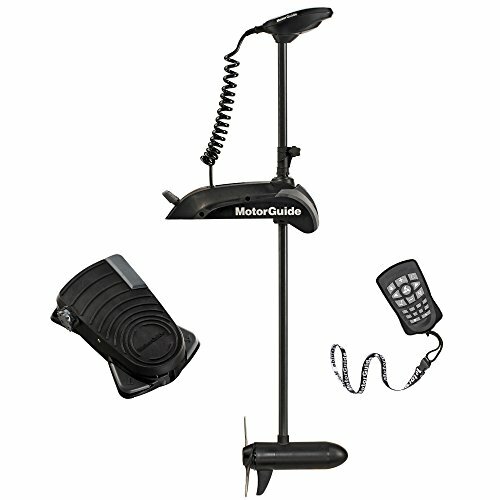 MotorGuide’s GPS motor control, Pinpoint GPS, offers several programs that allow you to anchor your boat in position, track specific courses, and lock in a heading and speed. With this technology, you can spend less time on the motor and more time focusing on the fish. Motors with Pinpoint GPS come with a wireless remote. The Xi5 uses a composite shaft that can take a tremendous amount of pressure without breaking or even warping under this stress as is often the case with shafts made from other materials. This shaft is also covered by a lifetime warranty. The Xi5 uses an advanced bearing system, a protective housing, and a rigid shaft support tube to deliver incredibly precise performance from its motor. The housing keeps out water and debris which leads to a motor that does not fall off regarding performance, after only a brief time of use. This technology also results in a quiet motor on the water. All electronics on the motor are fully encapsulated in a marine grade composite housing. This protection keeps out water and dust and leads to an increased life in your electronics. A big feature for a trolling motor that touts top of line electrical engineering. There are several differences between the various models that are available and are worth mentioning. Obviously, there is going to be differences in the peak thrust as well as the shaft length and the required voltage. There are also differences in the style of control. All of the models come with a wireless foot pedal, but some models are also available with a GPS remote for controlling the Pinpoint GPS features. For those that do not have a compatible GPS/Fishfinder might be interested in models coming with a remote. The other major difference is going to be if the trolling motor has an integrated sonar transducer. There are several features that we discussed that are present in all models of the Xi5. These include the composite shaft, Safari 2-Blade prop, and integrated LED battery meter. All of the models are compatible with the Pinpoint GPS technology and come with a wireless foot pedal. All models also use a digital variable speed control. 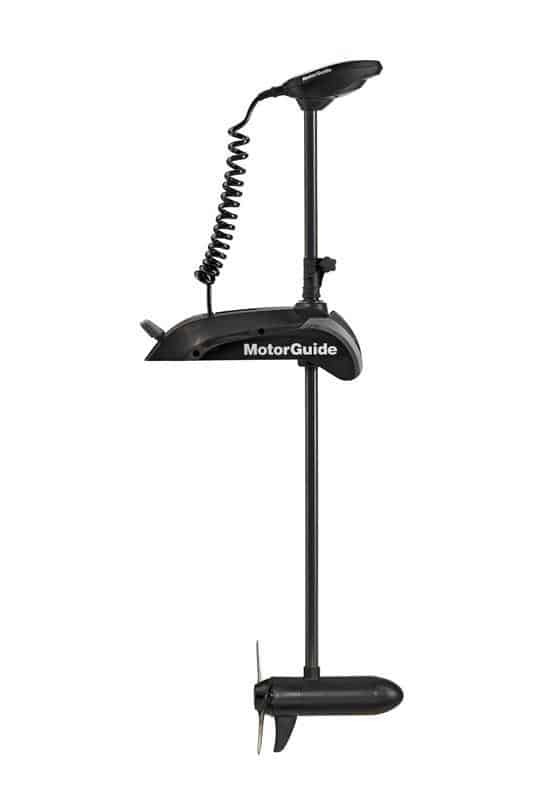 If you have any trouble selecting a variant, MotorGuide offers a simple motor selector tool. Even more so than your boat, the MotorGuide Xi5 model options let you pick out the perfect electric motor for your situation. With a 55, 80, and 105lb thrust options you have a power level that will match the size of most boats utilizing a bow mount trolling motor. We do wish there was a thrust model somewhere between the 55 and 80lb model, but both the 55 and 80 lb could substitute for say a 70lb model. You would just need to go one way or the other based on the type of water you mainly troll on. We also like that there are model options available without the Pinpoint GPS. While we like the software, some anglers don’t feel it’s necessary, and the overall performance of this trolling motor is pretty great even without the Pinpoint software. It also cuts down on the price slightly without it. On top of that, you also have the option for the integrated sonar. Some might want the transducer, especially if they do not already have a sonar that they feel comfortable with. Others might have a system they already love and having to remove and install a transducer would just be extra work. Even though it really shouldn’t play a role in selection, the truth is that a lot of us, ourselves included, like sharp looking products and products and the Xi5 mount has that going for it. These are low profile mounts made from anodized aluminum with a flat black finish. When mounted properly, it’s a sturdy base with several locking mechanisms to keep the motor locked in position when stowed or deployed. You will not feel any looseness in the shaft when deployed. It’s incredibly rugged with stainless steel components in the base. It also has a fantastic bearing system so although it is a lot of metal on metal interactions, it is still relatively quiet. The Xi5 also utilizes a stow and deploy lever at the base of the mount which disengages the locks and allows a much smoother motion for stowing and deploying. The MotorGuide Xi5 has had a lot of updates regarding its electronics. The electronic system in this motor is much more efficient and runs a lot cooler than previous systems used in other lines of their trolling motors. This efficiency also leads to less wasted energy through the form of heat giving the motor a much longer battery life. The Xi5 does not have the VRS technology because it utilizes a wireless foot pedal, but it still has pretty responsive control with the benefit of being able to control the motor from anywhere on the boat. The foot pedal itself is made from a quality composite material that doesn’t feel like it is going to break at any moment. With digital variable speed, you can dial it in with this trolling motor to give you the exact speed that you need without wasting battery life. While the VRS technology, which is wonderful, is not present on the Xi5, it makes up for it with a newly worked steering transmission. This is designed to greatly reduce the friction between moving parts and also to keep dust and water out which provides a very quite motor that delivers in the precision department. We have come across some reviews where users are not very satisfied with the wireless foot pedal due to delays between manipulating the pedal and seeing movement in the motor. Even so, the vast majority have been pleasantly surprised with the responsiveness of the pedal and the wireless remote. The Pinpoint GPS software offers you several different programs for controlling the trolling motor wirelessly. And while all of the motors are compatible with the technology, be sure that if you want the ability to use Pinpoint right out of the box, you do not buy a trolling motor that is only compatible. This will mean you will have to make a few extra purchases to get your motor ready. The GPS remote is a compact and water resistant remote that is lightweight and easy to have on your body without being cumbersome. It is extremely easy to get use to, and if you are not technology savvy, the owners manual provides clear and step by step instructions for setup and use. One of the most used features of the Pinpoint GPS is the anchoring technology. This GPS anchor uses GPS coordinates and keeps your boat locked into that position. The GPS anchor is going to keep you in position within a few feet, but it depends a lot on the water. So be careful when in tight quarters and be sure to keep an eye on your position. Though, the anchor is quite accurate. Check out this video demonstrating the Pinpoint anchor on the Xi5. You are also able to save up to eight anchor spots that your trolling motor can take you to automatically. Working with the anchor GPS system is the Jog function. While in anchor mode, Jog can reposition you five feet in any direction. It’s really useful when chasing a school of fish or to get a different angle on some underwater structure you are working. One of our favorite components of the Pinpoint GPS is the route record and playback function. With this, you can record and store up to eight routes that are up to four miles in length. Then, at any time, you can replay that route. For most of us, that is more then we will ever need, and it keeps you from having to remember exactly where that successful run was the next time you are on the water. Pinpoint GPS is also compatible with Lowrance fish finder units and can provide incredible fishing advantages. Other Pinpoint functions include a heading lock which will keep you on a straight line course and a cruise control function which can be used to set your exact wanted speed when on heading lock or route playback. As far as how all of these systems run, the reviews are excellent and point out great accuracy. Of course, it is GPS, so there is going to be a little variance in how well the motor holds exact course. You also have to keep in mind battery power as functions such as the GPS anchor might be sucking a lot of battery power if you are in choppy water or working against fast currents. Overall, it’s an excellent piece of software and exciting to see where trolling motor technology goes from here. There are a few other featured on the Xi5 that we didn’t cover in the preceding sections that we think are worth mentioning. The first is the LED dashboard on the front of the base mount. It uses several LED lights that give you quick indication of the status of several motor functions including power on, prop on, Pinpoint on, and battery life. The Xi5 also uses MotorGuide’s new composite shaft that utilizes both stainless steel and its warp and breakage resisting composite material. It’s also backed by a lifetime warranty for a little peace of mind. A very similar trolling motor to the Xi5 is the X5. It shares a lot of the same characteristics as the Xi5 with the most obvious difference being its lack of wireless control. The X5 still uses a foot pedal, but it comes with the popular VRS steering capability that makes it one of the most responsive foot pedals on the market. We do want to note that MotorGuide is set to release a new line of trolling motors, the Xi3, this year and might be another option to look at if you are interested in the Xi5. If we look elsewhere, the Minn Kota Ultrex has some similarities to the Xi5. The biggest difference between the two trolling motors is that the Ultrex does not use a wireless foot pedal. It does come with the i-Pilot GPS system which is very similar to MotorGuide’s Pinpoint GPS. You do not have the option for a smaller peak thrust under 80lbs for the Ultrex. The Ultrex, like the Xi5, also has the option for an integrated sonar and it also has more lift assist features built into the base of the trolling motor. In the grand scheme of things, the MotorGuide Xi5 and what it brings to the water is a fairly novel idea. With Pinpoint GPS technology as well as a wireless foot pedal, it is a hands-off approach to working a trolling motor. Some users don’t care all that much for the wireless foot pedal, but everything we have found with it indicates excellent control of the motor in both speed and directional control and a quiet running motor. The Pinpoint GPS features work great and stowing and deploying these motors is a breeze. The only issue we have is that gap in the peak thrust of the available models. Even with that, we still give the Xi5 wireless an A rating. It’s going to be exciting to see where the Xi5 leads in the next several years.